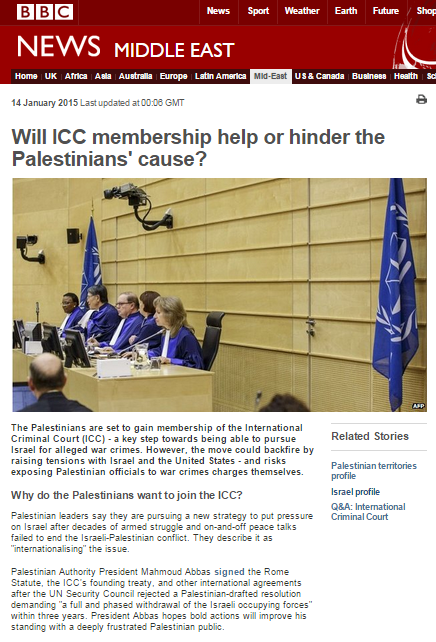 On January 14th an article was published in the ‘Features & Analysis’ section of the BBC News website’s Middle East page under the title “Will ICC membership help or hinder the Palestinians’ cause?“. The writer of the piece is not identified but from its layout we can determine that it is intended to provide a guide to the topic in Q&A format. The article includes several points worthy of note. “Palestinian leaders say they are pursuing a new strategy to put pressure on Israel after decades of armed struggle and on-and-off peace talks failed to end the Israeli-Palestinian conflict. They describe it as “internationalising” the issue. As has been the case in all BBC reporting on the issue of the ICC membership bid (and the UN Security Council bid which went before it), no effort is made to inform audiences that such moves breach existing agreements signed by the Palestinians and witnessed and guaranteed by members of the international community. That, of course, is correct but notably the BBC refrains from pointing out to audiences that – as is also the case with the UN HRC’s Schabas commission – the ‘start date’ selected by the PA deliberately excludes the kidnappings and murders of three Israeli teenagers by a Hebron-based Hamas cell on June 12th 2014. As we see, despite the existence of research carried out since the end of the hostilities which indicates that the statement “most of them civilians” may well be inaccurate, the BBC continues to promote out of date figures which it has not gone to the trouble of independently verifying during the last four and a half months. 5. Also in this section, readers are provided with further reading by means of a link to a BBC report from December 9th which amplified claims made in a report by Amnesty International without informing BBC audiences of the NGO’s political agenda or its involvement in the lawfare campaign against Israel. Readers are not informed, however, that one of those “other groups” which indeed fired thousands of missiles at Israeli civilian targets was Fatah’s Al Aqsa Martyrs Brigade and hence Mahmoud Abbas could be personally open to complaints, both in his capacity as head of the Fatah movement as well as head of the Palestinian Authority with its unity government to which (at least at the time of writing) Hamas is party.